The latest free update for Monster Hunter: World arrived this week, and it was jam-packed full of goodies, such as the fiery-blue Elder Dragon Lunastra (also known as Teostra's bae), a new tier of tempered monsters, new quests, and more. Among those monstrous new features, there was one, small addition that slid in behind the rest that isn't quite as explosive as a gigantic blue dragon, but it still looks slick as hell. We're talking about the brand new Brigade Layered Armor that you can get for (sort of) free after completing the Lunastra quest chain. You might recognize this armor set, because it's already kind of in the game. It looks very similar to the Brigade armor set that you can craft using coins from Arena quests, but it has one major difference. It's layered armor, which means you can wear it as a costume over your actual armor. The benefit to this is simply for aesthetics. 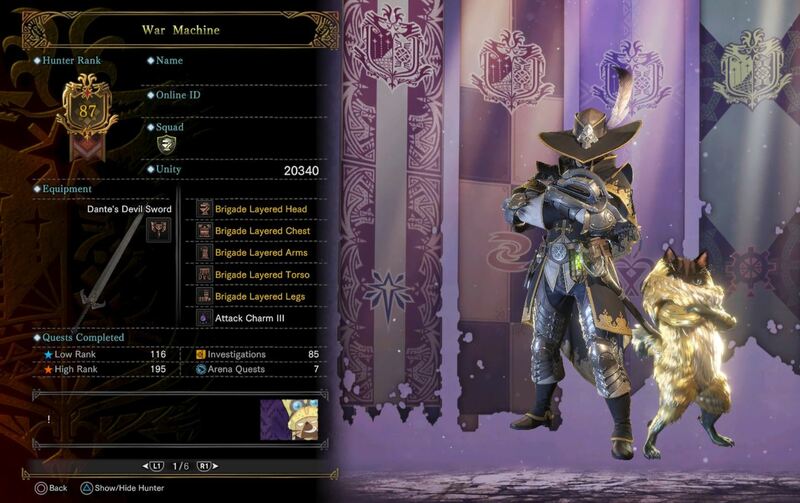 The original Brigade armor might look really cool, but its defensive stats and armor skills are definitely sub-optimal when compared to other high rank gear. Having this layered armor allows you to go all-in with the cool feathered hat without having to actually sacrifice your power. It's also more dyeable than the original Brigade set, so you can more easily mix and match it with other looks. Getting the Delivery that you'll need to actually earn the armor set is straightforward—you have to begin the Lunastra quest chain by talking to The Huntsman, and when you're finished with the final showdown against both the Teostra and Lunastra in the Elder's Recess, you can pick up this Delivery from the smithy. The Delivery calls for three things—5,000 Research Points, five Hunter King Coins, and five High Commendations. You'll already know how to get Research Points, since you've probably been amassing them through quests and investigations since you started the game. As long as you're a high rank hunter, you'll probably already have a few High Commendations, too, which you receive by beating special quests, like those that pit you against Elder Dragons. The tricky one is the Hunter King Coin, of which you'll need five. To get these, head to the Gathering Hub on the top level of Astera and walk up to the Arena counter. If you haven't done an Arena quest before, they're essentially time challenges that pit you against a specific monster. In those quests, you can choose between several sets of predetermined armor and weapons, which means your gear will be totally useless all the way down to the decorations. There are only a couple of these quests that actually award the Hunter King Coin, and the easiest one to farm is the Dodogama, which is the sixth quest. Pick an armor set from the list that has the proper resistances, as well as whichever weapon you think you perform best with, and start farming. It took us three quest completions, one on gold and two on silver, to amass all five coins, which is only about 15 minutes. That's not too troublesome for an armor set that looks as cool as this.